This was my fist ipod, in a rather fetching blue colour, a couple of years ago. I've included it in the reviews section because there are quite a few of these knocking around secound hand, and wanted to throw my views into the ring. First, if you're going to buy one, you have to make sure the navigation ring is ok and working properly, and get assurances that the battery life is still ok. 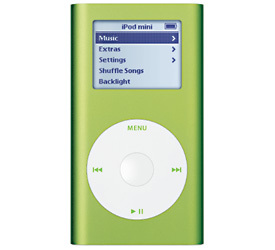 Replacement batteries can be had from Apple for their Ipods, but they are not cheap, and you might as well put your money towards a new Ipod. How was my Ipod mini? I loved it. It was my first MP3 player , and the way I could transfer thousands of tracks to it, then listen all day was great. The design is superb (but I wish I'd got a white one..) and the sound quality acceptable, although within a couple of weeks I'd replaced the standard Apple Ipod ear-buds with better Sony ones - well worth doing. Is my Apple Ipod Mini still going, almost 2 years later? Yes it is, although it has been replaced by its 20gb newer cousin and its being used by my son. It still works ok, but the battery life isn't what is was when new.